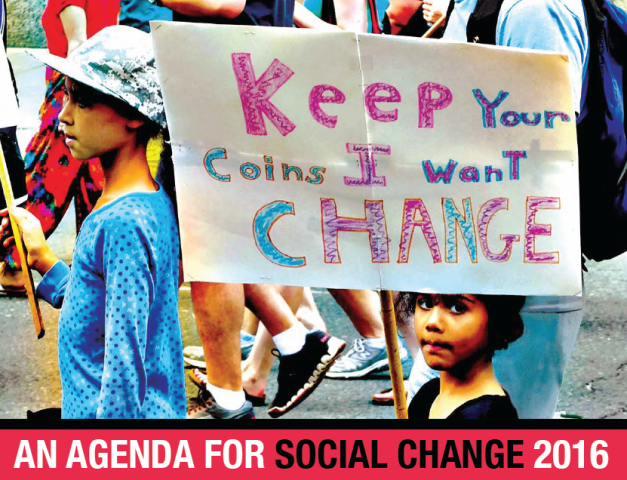 The CCPA is pleased to introduce our 2016 Calendar: An Agenda for Social Change. This is about more than keeping you organized – each month identifies and describes key dates in Canada’s social justice history. Each day readers have an opportunity to explore how debates about equality, gender, environment, First Nations, labour, trade, and social programs shape our development and identity. It’s an accessible way to learn about the creation of key programs such as health care, paid maternity leave, and the Charter of Rights and Freedoms. Readers will also learn the history behind the underfunding and dismantling of other initiatives such as the Court Challenges Program, Status of Women, and the Kyoto Accord. This is an innovative and original resource that provides an opportunity to remember our achievements (and where we need to keep working) on a daily basis while still being a functional – and beautifully illustrated – way to stay organized (and aware!). This year's calendar is packed with interesting historical facts and accessible story lines for each key date. Pick up one for yourself and another for a friend: it’s guaranteed to change the way you look at our history and the debates and decisions that continue to shape it. For more information on pricing for bulk orders and international shipping, please contact Melanie at 613-563-1341 x301 or [email protected].